Welcome to the "Wall of Death" a frightening carnival attraction where the audience views from the top of the drum, looking down. The riders start at the bottom of the drum, in the centre, and ascend an initial ramped section until they gain enough speed to drive horizontally to the floor, usually in a counter-clockwise direction. In the 2000s, there remain only few touring Walls of Death. "The Demon Drome", "Messhams Wall of Death" and the "Ken Fox Troupe". These acts feature original American Indian motorcycles which have been in use since the 1920s. 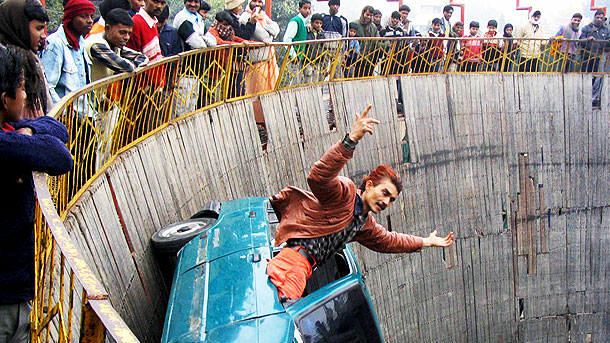 But if you head over to India, you can still see "Wall of Death" shows at numerous events and motorshows. Sometimes the drivers are on motorbikes but other times they are whirling around using cars - either way the dangers are still as extreme as ever. Tags: extreme sports, india, cars, motorbikes.